Tyler Cowen sounds a bit like Voltaire’s Pangloss when he argues, as the New York Times headline puts it, that we are living “all in all, [in] a more egalitarian world” (link). Cowen acknowledges what most people concerned about inequalities believe: “the problem [of inequality] has become more acute within most individual nations”; but he shrugs this off by saying that “income inequality for the world as a whole has been falling for most of the last 20 years.” The implication is that we should not be concerned about the first fact because of the encouraging trend in the second fact. Cowen bases his case on what seems on its face paradoxical but is in fact correct: it is possible for a set of 100 countries to each experience increasing income inequality and yet the aggregate of those populations to experience falling inequality. And this is precisely what he thinks is happening. 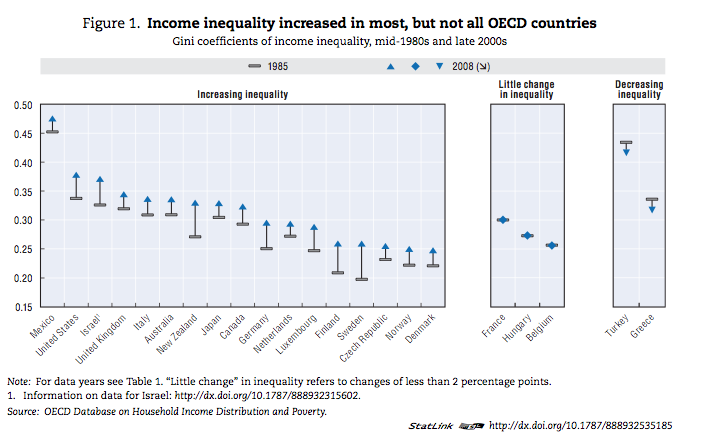 Incomes in (some of) the poorest countries are rising, and the gap between the top and the bottom has fallen. So the gap between the richest and the poorest citizens of planet Earth has declined. The economic growth in developing countries in the past twenty years, principally China, has led to rapid per capita growth in several of those countries. 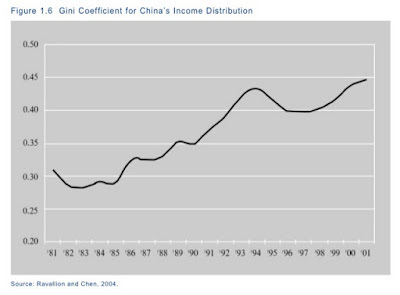 This helps the distribution of income globally — even as it worsens China’s income distribution. The seeming paradox raised here can be easily clarified by separating two distinct issues. One is the issue of income distribution within an integrated national economy — the United States, Denmark, Brazil, China. And the second is the issue of extreme inequalities of per capita GDP across national economies — the poverty of nations like Nigeria, Honduras, and Bangladesh compared to rich countries like Sweden, Germany, or Canada. Both are important issues; but they are different issues that should not be conflated. It is misleading to judge that global inequality is falling by looking only at the rank-ordered distribution of income across the world’s 7 billion citizens. This decline follows from the moderate success achieved in the past fifteen years in ameliorating global poverty — a Millenium Development Goal (link). But it is at least as relevant to base our answer to the question about the trend of global inequalities by looking at the average trend across the world’s domestic economies; and this trend is unambiguously upward. Here is a pair of graphs from The Economist that address both topics (reproduced at the XrayDelta blog here). The left panel demonstrates the trend that Cowen is highlighting. 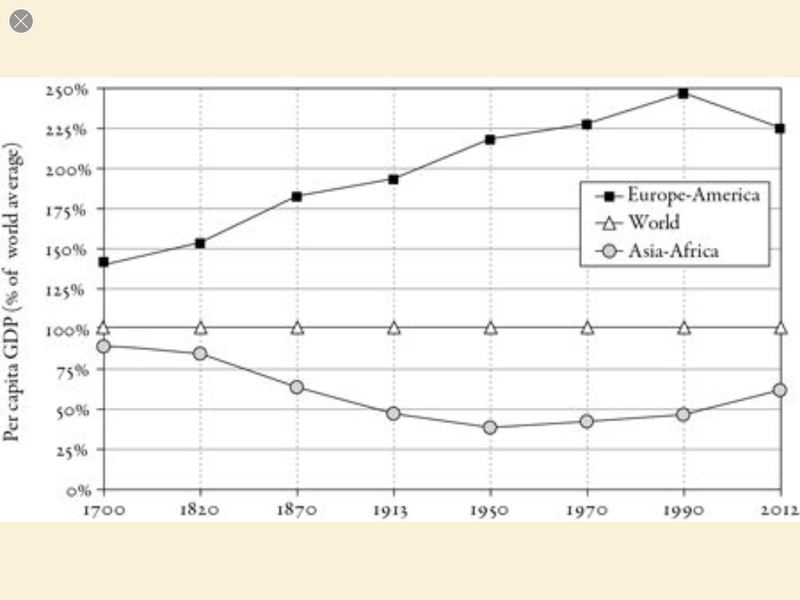 The global Gini coefficient has indeed leveled off in the past 40 years. 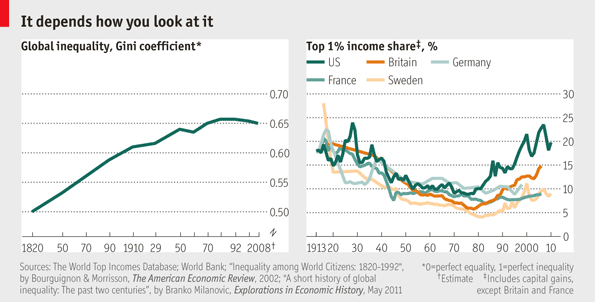 The right panel indicates rising inequalities in US, Britain, Germany, France, and Sweden. As the second panel documents, the distribution of income within a sample set of national economies has dramatically worsened since 1980. So global inequalities are both improving and worsening — depending on how we disaggregate the question. The global Gini approach is intended to capture income inequalities across the world’s citizens, not across the world’s countries. Essentially this means estimating a rank-order of the incomes of all the world’s citizens, and estimating the Lorenz distribution this creates. 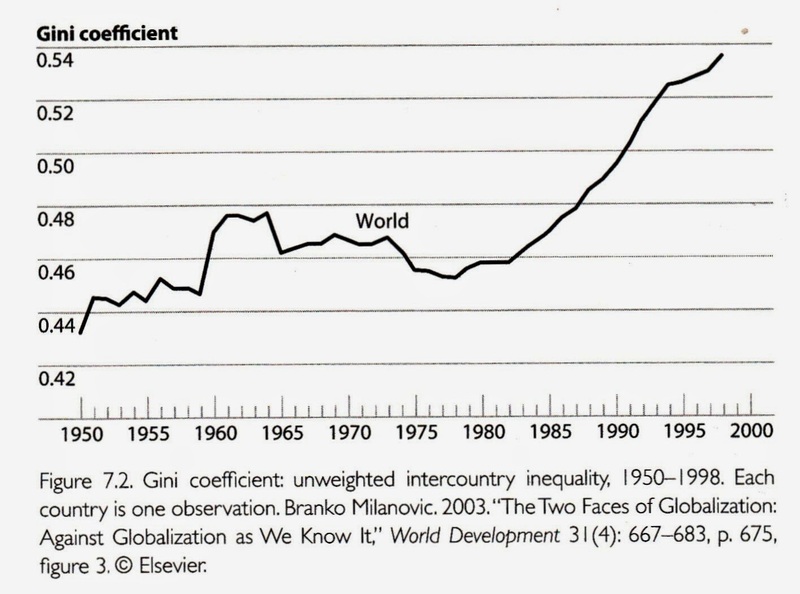 This graph makes the crucial point: inequalities across nations have increased dramatically across the globe since 1980, from a Gini coefficient of about .45 to an average of .54 in 2000 (and apparently still rising). And this is the most important point: most of these countries are suffering the social disadvantages that go along with the fact of rising inequalities. So we could use the OECD report to reach exactly the opposite conclusion from the one that Cowen reaches: in fact, global inequalities have worsened since 1980. So what about China? What role does the world’s largest economy (by population) play in the topic of global economic inequalities? 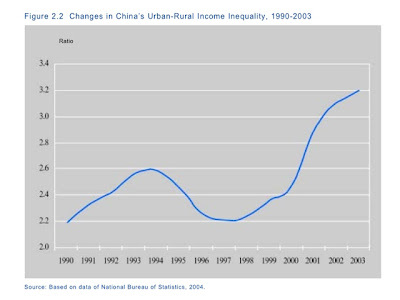 China’s per capita income has increased by roughly 10% annually during that period; as a population it is no longer a low-income economy. 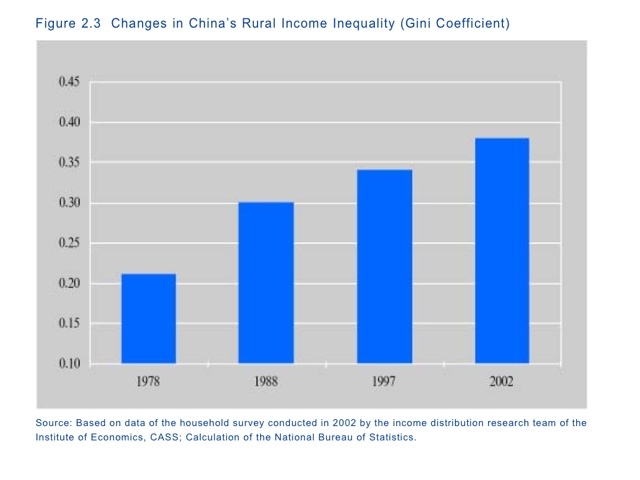 But most development economists who study China would agree that China’s rapid growth since 1980 has sharply increased inequalities in that country (link, link). 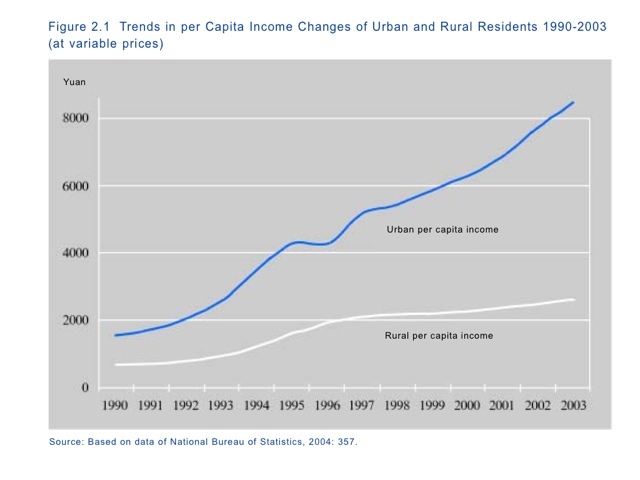 Urban and coastal populations have gained much more rapidly than the 45% or so of the population (500 million people) still living in backward rural areas. 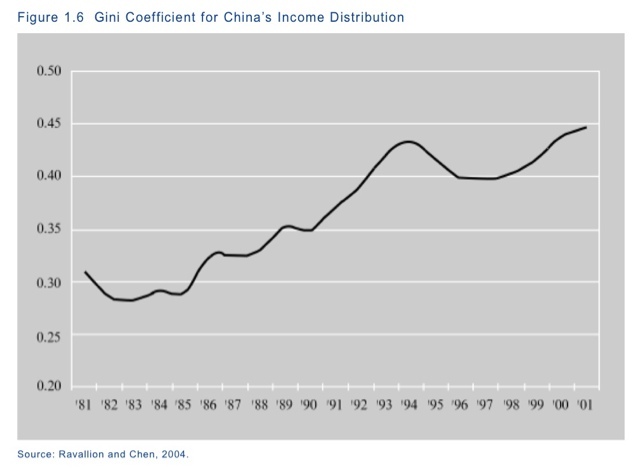 A recent estimate found that the Gini coefficient for China has increased from .30 to .45 since 1980 (link). 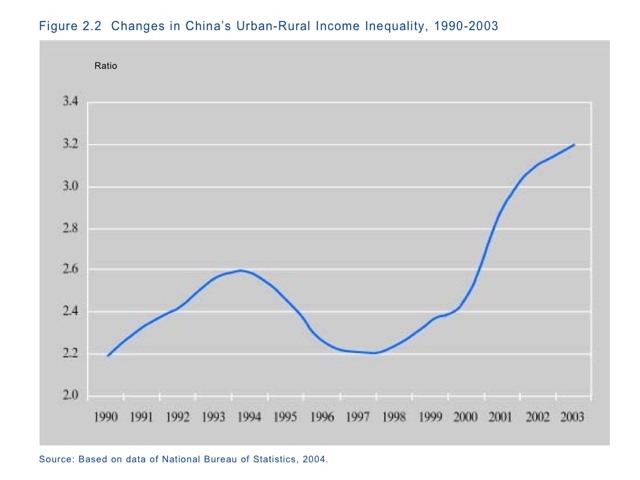 So China’s rapid economic growth has been a major component of the trend Cowen highlights: the rising level of incomes in previously poor countries. At the same time, this process of growth has been accompanied by rising levels of inequalities within China that are a source of serious concern for Chinese policy makers. So rising global income inequality is not a minor issue to be brushed aside with a change of topic. Rather, it is a key issue for the economic and political futures of countries throughout the world, including Canada, Great Britain, the United States, Germany, Egypt, China, India, and Brazil. And if you don’t think that economic inequalities have the potential for creating political unrest, you haven’t paid attention to recent events in Egypt, Brazil, the UK, France, Sweden, and Tunisia.